One of the first things that come to mind when the learning one is pregnant is to ensure we can offer a safe and secure home to our baby. When kids start to walk they want to explore the world. They are inquisitive by nature and hungry for adventure. The fact is that while this is a great and incredible phase of a child’s life, it is also the most nerve wrecking phase for the parents. Being so innocent and young also makes them naïve to the dangers around them. 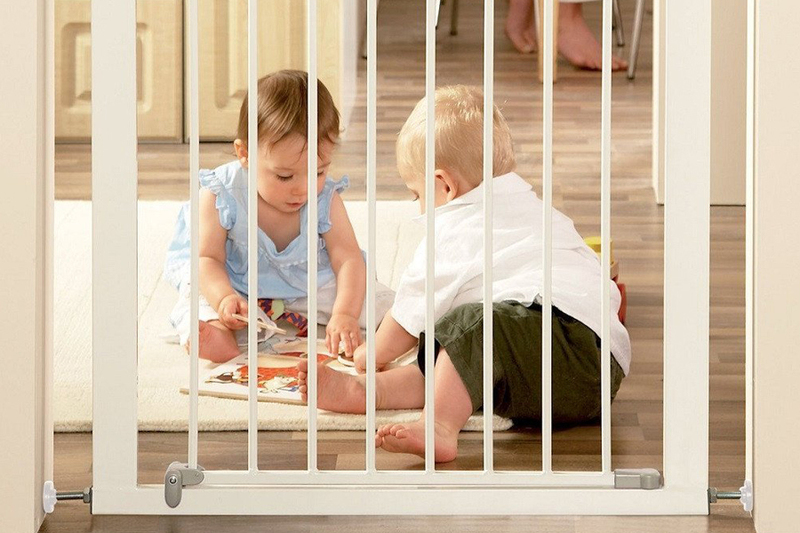 Baby safety gates are the answer to all your fears. Investing in a good quality gate will allow your toddler to safely wonder around, giving you the peace of mind that every caring parent need. This incredibly strong metal gate is ideal for the home that has an array of openings throughout the home. It can be adjusted to accommodate any opening ranging from 29 inches to as wide as 52-inches. This is all possible because it comes with a 6 inch and 12 inch extension kits. The one hand triggered lever handle is ideal for those occasions that you have your baby in your arms and cannot afford to fuzz and battle to open the gate. It is so convenient that you do not need any tools to assemble it. This gate also comes with mountings that can be used if you would like to have them placed permanently in one location. Even though it is made out steel and opens wide, it only weighs 11 lbs making this gate easy to remove and carry around the house. 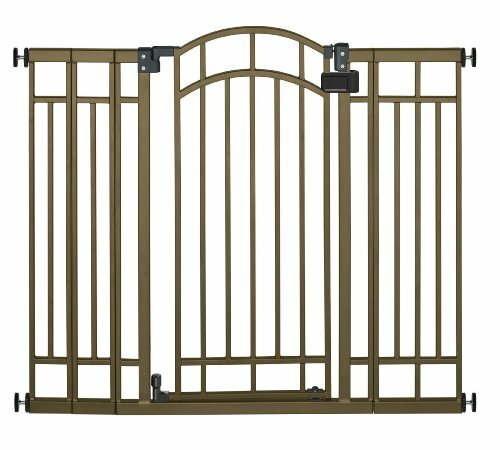 This elegant bronze 36 inches tall gate will give the protection you need for your child, while at the same time complementing the décor of your home. It comes with extensions to fit in any opening ranging from 28 inches to 48 inches wide. It also comes with mountings that allow you to permanently install this beautiful gate anywhere your heart desires. This gate was designed with the safety of your child in mind, but also taking into consideration the needs of the parent. That is why this walk-through gate can be easily opened with just one hand and it will automatically lock itself behind you. As you can see, this incredible gate meets all the needs and wants of that conscious, precautious and stylish parent. This sturdy and versatile safety gate is ideal for any door and staircase. It extends from 29 inches to 34 inches. It also comes with pressure mounts and extensions that do not require any tool for installation and which were designed to not damage your walls. 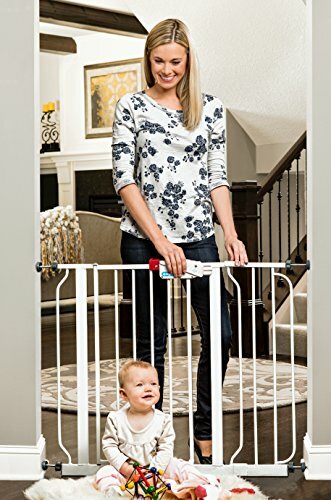 Unlike most baby gates, this one was designed to be easily opened with a lever handle that can be handled with just one hand. You can rest assured that this gate will deliver what it promises as it meets all ASTM Standards and is JPMA Certified. You will be delighted by how easy this gate is to put together and use while giving your child the protection he/she needs.